This full time Speech Language Pathology Assistant educational program prepares individuals to work in a health or educational setting under a registered speech pathologist with at least two years of professional experience. Assistants generally work with equipment maintenance, patient assessment, paperwork and execution of speech pathologist treatment plans. Courses in this program are structured to provide students with background information, theories, principles and techniques for implementation of treatment plans and goals of speech, language, and hearing disordered individuals. 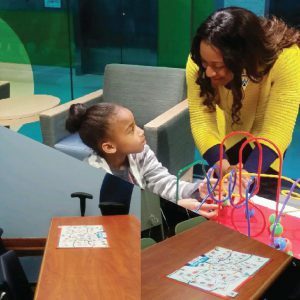 The program supplements classroom instruction with required supervised clinical observation and practicum experiences in speech language pathology and audiology. Students will be assigned to off campus practicum sites for observation of clinical experiences and involvement in interdisciplinary team approaches to case management. Accreditation through the Higher Learning Commission, the Illinois Community College Board, Illinois Board of Higher Education and the Illinois State Board of Education. Upon successful completion of all academic and fieldwork requirements, students receive an Associate in Applied Science (AAS) Degree. Prior to enrolling in the Speech Language Pathology program, students are advised to review the applicable licensure / certification procedures and requirements and state laws of the professions to ensure that they are eligible to receive a license / certification following completion of the Speech Language Pathology Assistant Program at South Suburban College. Eligibility for licensure may be limited by the results of a criminal background investigation. Individuals who have been charged with or convicted of a felony and/or have had any other professional license revoked or suspended or has been found by any court to have committed malpractice, negligence or recklessness is advised to seek an EARLY DETERMINATION REVIEW from Illinois Department of Financial and Professional Regulations to determine their eligibility for licensure/certification. NOTE: Criminal background checks are required for all admitted students for fieldwork. Additionally, students may be subjected to fingerprinting and/or drug screening for specific fieldwork sites. To provide learning experiences that foster a positive environment that emphasizes respect for the individual and development of the student’s personal and academic growth in assisting in the provision of quality services to individuals with communication disorders. Identify the laws and policies regulating the SLPA field. Label, identify and define vocabulary and concepts that pertain to the field of speech pathology. Analyze a language sample for accurate Mean Length of Utterance (MLU). Define and explain major parts and processes of the brain as it relates to speech and language development. Write in an objective, organized and grammatically correct technical writing style as used in the field of speech-language pathology. Recognize their own professional limitations within the ethical/legal boundaries of training and job responsibilities of an SLPA. Identify, describe and discuss the critical competencies of being an SLPA. Demonstrate personal responsibility in carrying out their roles as observers in educational and medical speech-pathology settings in a professional and ethical manner. Demonstrate the ability to write a comprehensive description of the therapy session observed to include identification of materials used, description of client behaviors and the students own personal reflection using correct rule for grammar, punctuation and spelling. Demonstrate knowledge of the basic terminology related to human communication disorders. Demonstrate knowledge of the basic principles of evaluating and assessing individuals with communication disorders. Identify appropriate therapy material as it relates to clinical practice. Demonstrate beginning skills performing as a speech language pathology assistant by following documented treatment plans, assisting a speech language pathologist in service delivery, accurately documenting client performance, accurately recording data and preparing materials, demonstrating appropriate written and oral communication, interpersonal skills, ethical behaviors and health and safety precautions. Demonstrate intermediate to advanced skills performing as a speech language pathology assistant by following documented treatment plans, assisting a speech language pathologist in service delivery, accurately documenting client performance, accurately recording data and preparing materials, demonstrating appropriate written and oral communication, interpersonal skills, ethical behaviors and health and safety precautions. To provide comprehensive, academic, and practical education and training for Speech Language Pathology Assistants. Train SLPAs to effectively treat adults and children with various communication disorders. To provide SLPAs with knowledge of the scope of practice of speech language pathology while training SLPAs how to accurately assist SLPs. To promote and increase community awareness of the need and role of speech language pathologist and speech language pathology assistants. To Train speech language pathology assistants to be well rounded allied health professionals while assisting and encouraging speech language pathology assistants to further pursue an advanced degree in the field of communication disorders. Cumulative grade point average of 2.7 or better for program prerequisites. Admission to the College does not guarantee admission to the program. Students will be notified of status by mail after June 30th. All students must demonstrate a minimum math competency equivalent to Elementary Algebra (MTH 095) to fulfill the AAS degree requirement as well as complete all general education and SPA Program coursework with a “C” or better or they will be dismissed from the program. Once admitted, students must present proof of CPR certification and maintain certification through the entire educational program, as well as complete a physical and submit to a criminal background check.